The first step to being an effective listener is to realize that hearing is not the same thing as listening! Watch out for being so focused on what you say that you end up hearing instead of listening! Hearing is merely taking in audible sounds. It is passive, and requires no effort other than hearing what is being said on the surface. Hearing provides little feedback to others, and lacks collaboration, empathy and does not promote closeness. On the other hand, listening requires more effort as you interpret messages on both non-verbal and verbal levels. 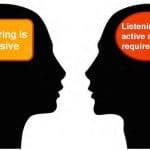 In active listening, you decipher actively the message being expressed by the other person, including acknowledging the other person’s feelings. In active listening, you reflect what is heard in a nonjudgmental fashion. That entails validating and empathizing with the other person, instead of trying to force your own point. Did you ever notice that in the midst of an argument, people talk at each other and not with each other? When you talk at each other, you are hearing. When you talk with each other, you are listening. Those who merely hear instead of listen will be more likely to argue and defend themselves. Just think of how many altercations and misunderstandings people could avoid by using good listening skills! CLARIFY – DON’T INTERROGATE —Do not demand reasons or justifications when you clarify. Summarize what is said in a nonjudgmental fashion. “ So, to be clear, are you telling me that you do not want to make plans with them again? For more tips, click here to learn to use statements that help others express themselves. How about you – are you a good listener or do you tend only to hear? Think of the last time you had a disagreement with someone. Did you listen or did you just hear? As an active listener, you will give others the gift of nonjudgmental acceptance and empathy. Those are core skills in developing healthy, respectful relationships both personally and professionally.